I eventually tried again and went to my ‘Lectorial’ where we read an article about deep attention. The article was published in 2007 and it was referring to people who were 12 years old. which means that its basically now referring to us. It was comforting to know that the education system has realised that we are Hyper Attentive and it will no longer work to use a deep focus approach. Because it definetly feels that thats what the education system has been trying to make us conform to. Furthermore it spoke about whether hyper or deep attention was better and which our generation preferred. I suppose at this point i was interested to note procrastination. I thought about how people of my generation do like to procrastinate. The artile referred to how it was more efficient to do tasks back to back than to try and multitask and do them all at once. And i noticed that when i do multitask – tats actually how i facilitate my procrastination. However, its also curious that i personally need my own moments of deep attention. for example when i was studying and doing my a levels i noticed that in order to actually work i would need o just focus on the task at hand. So i suppose that I need to explore this further and really find out where my sweet spot is in terms of hyper vs deep attention. 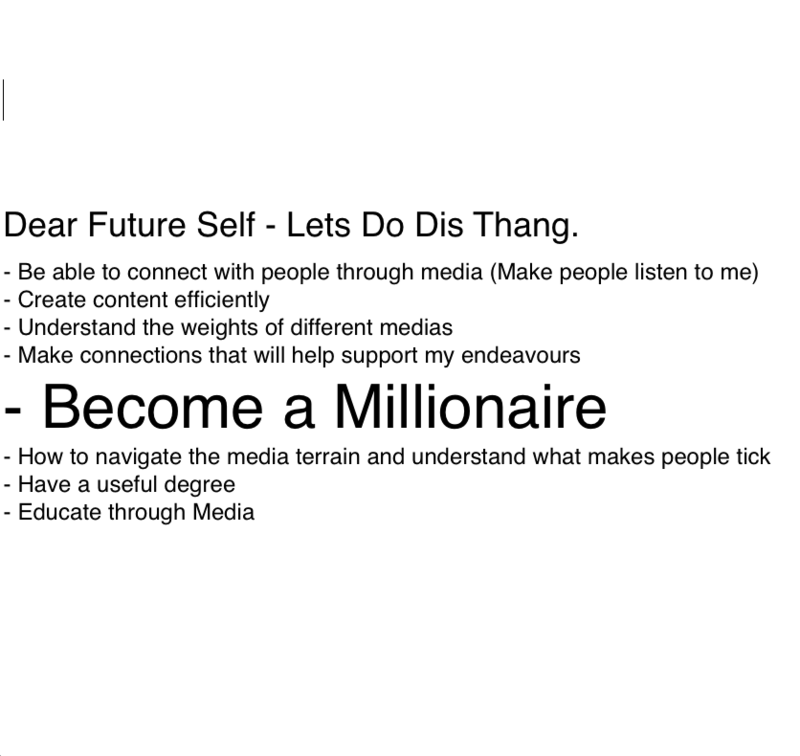 For this course specifically this is going to be important – for example i think its necessary to mention i was quite relieved to find out that for Media 1 projects we actually had to CREATE media and that this was the preferred form of assessment – simply because essay writing is NOT my thing. I also formed a list of my goals for later this course. which i have attached onto the bottom of this blog post – so check it. Yadig?